Air conditioning can increase a building's energy consumption and associated carbon emissions enormously. Despite an air conditioning system's voracious appetite for energy most organizations use one – even in winter – often because of the extra heat generated by increasing use of IT equipment. But following some simple, low-cost steps a business can save energy and make its air conditioning system more efficient. Temperature control: make sure your climate control doesn't operate below 24°C. Also, make sure that you don't have the heating and cooling systems competing with each other, which is a waste of money. 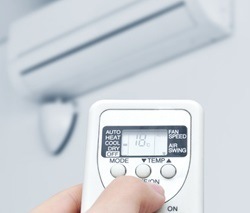 The best way to do this is to keep a temperature gap between your heating and air conditioning control temperatures. Variable speed drives: don't produce more cooling than you need - this wastes money and energy. Variable speed drives can vary the output of your air conditioning system to meet your needs throughout the day. This will help cut your energy costs. Free cooling coils: these coils use the outside air as a source of cooling for air conditioning systems. This saves money because you won't need to use as much energy to produce cooling for the air conditioning system. With the UK's temperate climate, free cooling coils can produce big savings.